Objective: In this study, we report 5 patients with heterogeneous phenotypes and biochemical evidence of respiratory chain (RC) deficiency; however, the molecular diagnosis is not mitochondrial disease. Methods: The reported patients were identified from a cohort of 60 patients in whom RC enzyme deficiency suggested mitochondrial disease and underwent whole-exome sequencing. Results: Five patients had disease-causing variants in nonmitochondrial disease genes ORAI1, CAPN3, COLQ, EXOSC8, and ANO10, which would have been missed on targeted next-generation panels or on MitoExome analysis. Conclusions: Our data demonstrate that RC abnormalities may be secondary to various cellular processes, including calcium metabolism, neuromuscular transmission, and abnormal messenger RNA degradation. Respiratory chain (RC) complex defects are hallmarks of mitochondrial disease that often provide the first diagnostic evidence for a mitochondrial disorder and guide subsequent DNA analysis of the mitochondrial DNA (mtDNA) and nuclear genes encoding mitochondrial proteins.1 In a substantial proportion of cases, it is not possible to reach a molecular diagnosis, and it is assumed that most of these patients carry undetected mutations in genes coding for mitochondrial proteins. This report presents 5 patients with heterogeneous phenotypes and biochemical features of RC deficiency; however, the molecular diagnosis is not mitochondrial disease. Patients with biochemical evidence of RC deficiencies measured by standard methods in accredited laboratories in whom mtDNA mutations had been excluded were selected from a cohort of 60 patients for whole-exome sequencing.1 The diagnosis of a mitochondrial RC deficiency was based on the recently published consensus paper by the Mitochondrial Medicine Society (USA).2 Coverage and depth statistics of exome sequencing for each patient and the bioinformatic prediction for each mutation are listed in tables e-1 and e-2 at Neurology.org/ng. Informed consent was obtained from all participants in accordance with protocols approved by local institutions and research ethics committees. Patient 4 belonged to a large Hungarian Roma pedigree presenting with hypomyelination, hypoplasia of the cerebellum and corpus callosum, and spinal muscular atrophy. Muscle biopsy revealed reduced complex I (60% rest-activity) and IV (80% rest-activity). We identified a homozygous c.815G>C, p.Ser272Thr mutation in a novel disease gene EXOSC8 encoding an exosome subunit involved in AU-rich element (ARE)-containing messenger RNA (mRNA) degradation, and the altered myelination was due to abnormal degradation of ARE myelin proteins.6 The pathogenicity of the mutation was supported by the absence of EXOSC8 protein in myoblasts of the patient and by segregation with the disease in the large pedigree.6 A secondary RC defect in these patients may be related to abnormal degradation of ARE mRNAs of mitochondrial disease genes. Faced with increasing numbers of published disease-causing variants, improved and more accessible sequencing techniques, and more comprehensive phenotype characterization, the clinician should keep an open mind when approaching genetic testing and not limit testing to predicted disease-causing variants in suspicion of mitochondrial disease. Dr. A.P. : study concept and design, acquisition of data, and drafting of the manuscript. Dr. H.J.N. : study concept and design, acquisition of data, and drafting of the manuscript. Dr. H.G. : analysis and interpretation. Dr. A.A.: critical revision of the manuscript for important intellectual content. Dr. J.K.: acquisition of data. Prof. I.B. : acquisition of data. Dr. M.C. : acquisition of data. Dr. K.D. : analysis and interpretation. Ms. L.F.: analysis and interpretation. Dr. M.K. : acquisition of data. Dr. B.C. : acquisition of data. Dr. S.K. : acquisition of data. Dr. M.S.-K.: interpretation of data. Dr. V.K. : acquisition of data. Prof. E.H.-F.: critical revision of the manuscript for important intellectual content. Prof. P.F.C. : critical revision of the manuscript for important intellectual content. Prof. R.H.: study concept and design, acquisition of data, and drafting of the manuscript. R.H. was supported by the Medical Research Council (United Kingdom) (G1000848) and the European Research Council (309548). P.F.C. is a Wellcome Trust Senior Fellow in Clinical Science and an NIHR Senior Investigator who also receives funding from the Medical Research Council (United Kingdom), the UK Parkinson's Disease Society, and the UK NIHR Biomedical Research Centre for Ageing and Age-related disease award to the Newcastle upon Tyne Foundation Hospitals NHS Trust. Dr. Pyle, Dr. Nightingale, Dr. Griffin, and Dr. Abicht report no disclosures. Dr. Kirschner has served on scientific advisory boards for PTC Therapeutics ISIS/Biogen Roche Pharma; has received funding for travel and/or speaker honoraria for ENMC workshop on neuromuscular diseases (nonprofit); has served as Associate Editor of the Orphanet Journal of Rare Diseases; and has received research support from the German Ministry of Research and Education European Union. Dr. Baric has received funding for travel and/or speaker honoraria from the Annual Multidisciplinary European Phenylketonuria Symposium; has served on the editorial board of Journal of Inherited Metabolic Disease; has served as prinicipal investigator in clinical trials sponsored by Synageva BioPharma; and has received research support from Ministry of Science, Education and Sports of Republic of Croatia and Innermed. Dr. Cuk, Dr. Douroudis, Ms. Feder, Dr. Kratz, Dr. Czermin, and Dr. Kleinle report no disclosures. Dr. Santibanez-Koref has received research support from Medical Research Council, The Leverhulme Trust, and Sir Jules Thorn Charitable Trust. Dr. Karcagi and Dr. Holinski-Feder report no disclosures. Dr. Chinnery has served on the editorial board of Brain and has received research support from the Medical Research Council (United Kingdom). Dr. Horvath has received funding from the Medical Research Council (United Kingdom) (G1000848), the European Research Council (309548), and from the Mitochondrial European Educational Training (MEET), ITN MARIE CURIE PEOPLE, (317433). Go to Neurology.org/ng for full disclosure forms. Funding information and disclosures are provided at the end of the article. Go to Neurology.org/ng for full disclosure forms. The Article Processing Charge was paid by Wellcome Trust Funding. Accepted in final form April 7, 2015.
. Use of whole-exome sequencing to determine the genetic basis of multiple mitochondrial respiratory chain complex deficiencies. JAMA 2014;312:68–77.
. Diagnosis and management of mitochondrial disease: a consensus statement from the Mitochondrial Medicine Society. 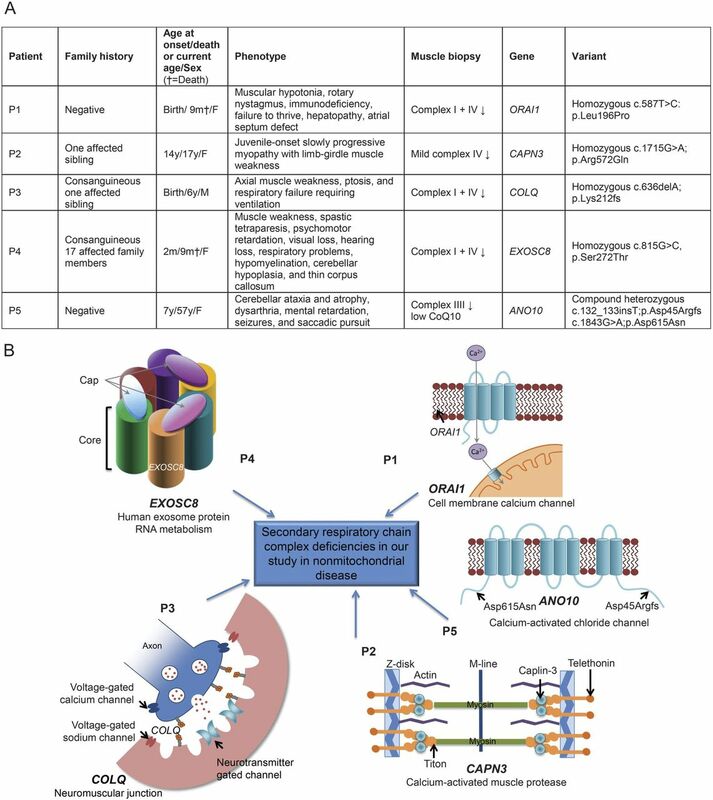 Genet Med Epub 2014 Dec 11.
. CRAC channelopathies due to mutations in ORAI1 and STIM1. In: Ochs HD, Smith CIE, Puck JM, editors. Primary Immunodeficiency Diseases: A Molecular and Genetic Approach, 3rd ed: New York: Oxford University Press; 2013:279–285.
. Redox state and mitochondrial respiratory chain function in skeletal muscle of LGMD2A patients. PLoS One 2014;9:e102549.
. Clinical and molecular genetic findings in COLQ-mutant congenital myasthenic syndromes. Brain 2008;131:747–759.
. EXOSC8 mutations alter mRNA metabolism and cause hypomyelination with spinal muscular atrophy and cerebellar hypoplasia. Nat Commun 2014;5:4287.
. ANO10 mutations cause ataxia and coenzyme Q10 deficiency. J Neurol 2014;261:2192–2198.
. Autosomal recessive cerebellar ataxia type 3 due to ANO10 mutations: delineation and genotype-phenotype correlation study. JAMA Neurol 2014;71:1305–1310.
. Molecular diagnosis of infantile mitochondrial disease with targeted next-generation sequencing. Sci Transl Med 2012;4:118ra110.
. Early mitochondrial dysfunction in an infant with Alexander disease. Pediatr Neurol 2006;35:293–296.